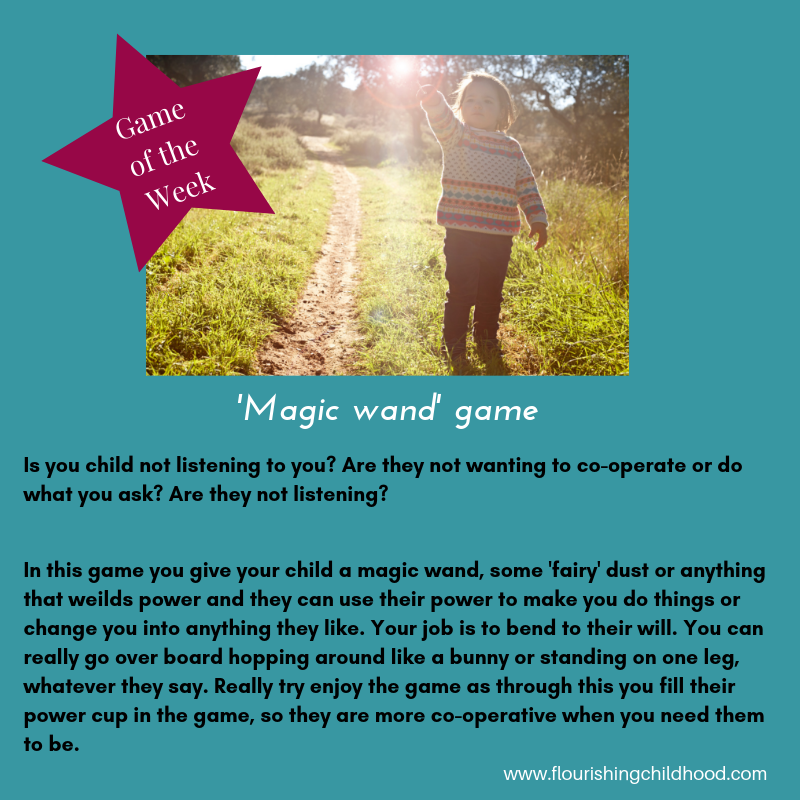 This week it is the 'magic wand' game. And it's as simple as that. If you don't have a magic wand you could make one, but my 6 year old even turned a dolphin ornament into a magic wand the other day. In this game you encourage your child to turn you into what ever they like, or to make you do anything they tell you! I am sure once they get the hang of it they'll think of all sorts of amazing ideas to make life a little more exciting for you both. After a rather stressful day this week my 6 year old for some reason had something in her hand that looked like a wand, and when she pointed it at me I started to ribbit. She pointed it again and I stopped. Her whole body turned to me in interest and she tried pointing again, and for some reason I started talking in a very posh accent pretending I was a queen. At this point her youngest sister had wandered over to see what was happening. They both burst out laughing. But really hearty laughing. Then they wanted to choose what I was to turn into and then making me stop each time too. We played this for about 10 minutes and then I said, 'right it's time to brush teeth, should we hop like bunnies to get there.' And off we all hopped. Prior to this there was lots of difficult behaviour and lolling about which drives me nuts!! I just love it when a game pops up and through the connection we are able to move past the issue through all the laughter released. Have fun and notice how it changes things in your day. It's great as a preventative to things like leaving the house or doing things you want your child to do that they may not want to. Power and autonomy are such an important need in all of us so fill that cup right up in this beautiful game.